Before the kids left home, they had to learn how to make an omelet, at least we knew they would be able to feed themselves. 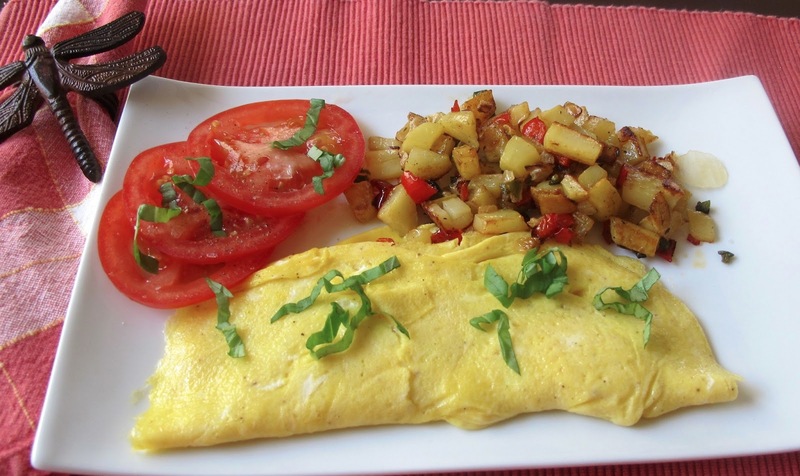 The omelet can take on any flavors, from Mediterranean to Southwest. They can be light or hearty, the ultimate fast food. For this single omelet, I filled it with Boursin cheese and topped with fresh basil. The Bake was heading out for a day of golf so I made a side of home fries. In a bowl, mix the eggs well, breaking up the yolks, and season with salt and pepper. In a 10 inch non-stick skillet over medium heat, melt the butter. Add the eggs and swirl the pan, spreading the eggs. Using a spatula, push the eggs into the center and swirl the pan again, to keep the eggs from sticking. Add the filling (cheese) to the center of the eggs and flip the omelet in half. Slide the finished omelet onto a plate and garnish with basil. In a large non-stick pan, heat oil over medium heat. Add potatoes, onion, and peppers to pan, season with thyme, salt and pepper. Cook about 20 minutes until softened and lightly browned.